A fluorescent tube has its own ballast which can either be of the inductive or electronic type which is used to drive the tube itself. In a standard energy saving light bulb of the CFL type this is actually contained within the bulb itself but with traditional fluorescent tubes this is normally separate and located inside the light fitting. Conversely with our LED Tubes the driver is actually part of the LED tube itself so the LED tube is a totally integrated stand alone unit which can simply be wired up to the mains. This means that if you are fitting an LED tube to a conventional fitting then you need to make a few simple modifications to the wiring. Here is a graphic illustration showing the modifications necessary for the 2 types of installation. In simple terms if you have a fluorescent tube fitting with an old fashioned starter you can simply remove the starter and then short circuit the connections across the inductive ballast. 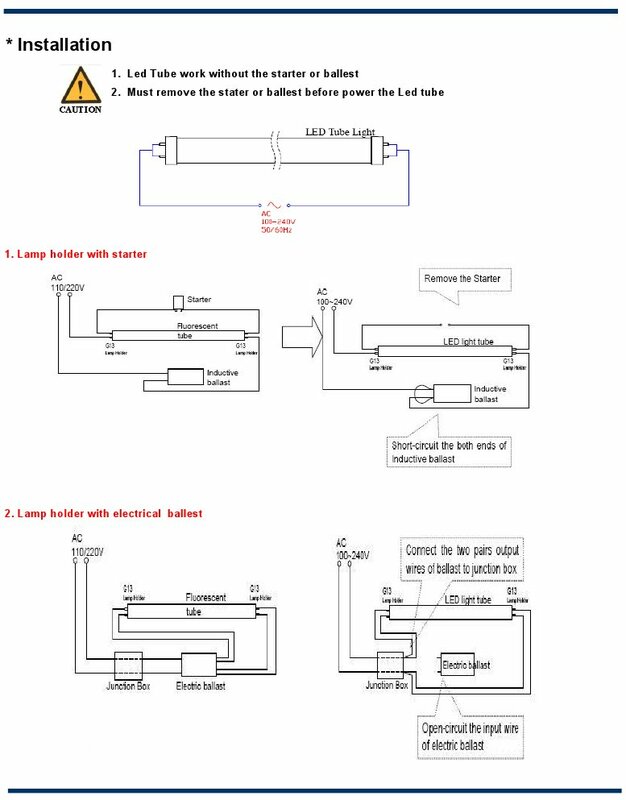 This will take the inductive ballast out of the circuit and mean that you have mains voltage applied to either end of the LED tube. The LED tube will then light up correctly. Alternatively if you have a fluorescent fitting with a electronic ballast then you need to remove this from the circuit. This can be simply done by cutting the wires to the electronic ballast and connecting the mains neutral to one end of the LED Tube and the mains live to the other end. The LED tube will then operate correctly. So to summarise with an LED tube you simply need to connect the mains live to one and and the mains neutral to the other and it will then operate. This is much simpler than with the old style fluorescent tubes and in time the lighting fixture suppliers will provide holders which work directly with LED tubes. These will in fact be a simpler design so in theory an LED tube light fitting should be cheaper than a conventional fluorescent tube holder. But watch out to make sure that the manufacturer do actually charge less! Once you have converted your fitting to take an LED tube then I would imagine you will never look back, but if you want to convert back then just keep the starter and these notes and you will be able to revert back to the old set up. If you have a lot of fluorescent tubes then you will potentially want to convert them all. First try one and once this is up and running you should be able to tackle the others in the same methodological fashion and change the set in a rapid succession. And don’t forget that this time invested now will reap rewards in the future because an LED tube will last typically 5 times longer than a traditional fluorescent tube so you will not have to keep changing the ones that fail.